This is a list of over 50 Churches in the Old City of Jerusalem - of all different Christian denominations, of all different periods in Jerusalem's history. 1 Church of the Holy Sepulchre Center of the Christian Quarter The most important church in the Christian world. The location of Christ's crucifixion, burial and rebirth. See separate detail of the church's history, the chapel complex and their meanings. 2 The Coptic Patriarchy and the St. Antonius Church The Ninth Station Established in 1236, when a Coptic Archbishop was appointed in Jerusalem. The Patriarchy is located next to the 9th station in the large complex which houses the Patriarchy's offices, as well as the Church of St. Antonius (251-356), an Egyptian monk, founder of monasticism in the East and considered the founder of monasticism in all of Christianity. The community numbers thousands of believers in Israel, out of the million living in Egypt. 3 St. Helena Church - Coptic The Ninth Station Near the ninth station and the Coptic Patriarchy, named for Constantine's mother, discoverer of the holy cross. According to tradition, Helena brought the Coptics to Jerusalem to help build the Church of the Holy Sepulcher. At the North end of the church there is a stairwell leading to a giant, ancient water pit that still holds great quantities of water. It may be that the pit was part of the quarries in the area that existed prior to the building of the Church of the Holy Sepulcher. A fee is required in order to enter the pit. 4 The Greek Orthodox Patriarchy and the Church of St. Constantine and Helena Greek Catholic Patriarchate Street The first Patriarchy in Jerusalem, "Mother of Churches", was founded according to tradition in the days of James, Jesus's brother, the first Bishop of Jerusalem. In 451 Jerusalem was raised to the status of Patriarchy in the huge complex (30,000 sq. meters) belonging to the Patriarchy, which houses the Patriarchy's offices and the seat of the Patriarch responsible for the territory of Israel, Jordan and the West Bank, as well as approx. 150 monks representing all levels of priesthood, known as "The Brotherhood of the Holy Sepulcher". A church stands on the roof of the Patriarchy that serves the Brotherhood and commemorates the memory of Constantine, who defined Christianity as the religion of the Roman Empire in 324 and his mother Helena, who found the holy cross in Jerusalem and established the Church of the Holy Sepulcher. These two are considered the patrons of Christianity in the Holy Land and are called by the Orthodox Church: "Equal to the Apostles". 5 The Church of Mar Jacob – Arab Greek Orthodox Square of the Church of the Holy Sepulcher Names for James (Jacob), Head of the first Christian community in Jerusalem and the first Bishop of Jerusalem. Located next to the Church of the Holy Sepulcher, on the Western wall of the square. Serves Arab Orthodox believers and is active all day. 6 St. John's Church - Armenian Square of the Church of the Holy Sepulcher John was the Baptist. Entry is through the Eastern wall of the square, near the Church of the Holy Sepulcher and the Ethiopian chapels. The church is closed and opens only twice a year. 7 St. Abraham's Monastery – Greek Orthodox Square of the Church of the Holy Sepulcher Located at the South-East corner of the square. Used for residence. In the past it belonged to the Ethiopians, however in 1660 it changed hands to the Greeks, as the Ethiopians were unable to pay their taxes to the Turkish Sultan. There is a large water pit under the church dating back to the Byzantine era, and on the roof is an olive tree that according to tradition is the tree to which the ram was tied during the sacrifice of Isaac by Abraham, from which the church takes its name. 8 Gethsemane Church and Monastery – Greek Orthodox Square of the Church of the Holy Sepulcher Near the Umar Mosque. Houses residences and a church with an icon of Mary. On 28 Aug. Mary's death day is commemorated and the icon is taken to Gethsemane for 10 days. 9 Alexander Nevsky Church - Russian Opposite the Northern entrance to the Church of the Redeemer Established during the end of the 19th cen. by the "Russian Palestine Co.". After 1917 they became attached to the exiled Russian Church (the "White Russians") who fled Bolshevism and adopted a pro-Tsarist stance, although they remain an independent association to this day. Its name was given by the patron of Alexander the 3rd, a Russian prince named Alexander Yarouslavitz who expelled German and Swedish invaders from Russian soil (the "Battle of the Ice" in 1242). The name Nevsky comes from the Narva River, where the Swedes were beaten. During digging that was carried out during the beginning of building in 1857 an arch dating back to Roman times was found, identified as the "Justice Gate", through which Jesus was led on his way to crucifixion outside the city at Golgotha. 10 Church of the Redeemer – Lutheran Protestant Northern edge of Moristan St. The church was built in 1893-1897 on the ruins of the church of Santa Maria and parts of it were incorporated into the current church. The land was given to the church as a gift by the Ottoman Sultan to the Prussian Crown Prince Wilhelm (III), who laid the cornerstone and the church was dedicated at the presence of Kaiser Wilhelm II. "Redeemer" refers to Jesus. The principle belief of the German Martin Luther, founder of the Protestant stream in the 16th century, states that only God can decide who will believe and be redeemed as part of former divine decree, and none can change and be included in this group. The church stands out thanks to the bell tower which rises to a height of 40 m and has a spectacular view (fee). A fountain is located at the southern outer wall and is decorated with the 12 months of the year carved in stone centering on the sun and moon. The fountain is the gate of the church of Santa Maria Latina the Crusader. 11 St. Haralambos Church and Monastery – Greek Orthodox Via Dolorosa / Alhanka St., next to the Eighth Station Haralambos was an Orthodox priest for the Magnesian community during the reign of Emperor Alexander Severus (222-235 AD). Following a confrontation between him and the district governor, Lokianos, required Haralambos to abandon his faith or be punished. Since he would not renounce the Christian faith, he was severely tortured all over his body until he died. Christians commemorate his Memorial Day on February 10. 12 Ethiopian Patriarchy Deir Al Habash St. The Ethiopian Church has about 25 million believers and they trace the origins of their faith to King Solomon and Queen Sheba. Despite being the oldest Christian church in Africa, the appointment of the Ethiopian was only in 1959, by Coptic Pope Kirill V and since the Ethiopians have been released from the auspices of the Coptic Church. There is a property dispute in Jerusalem between the communities. Head of the church in Jerusalem is an Archbishop, one of the ten Archbishops of the Ethiopian Church. 13 Dom Polski – Polish Catholic Monastery Albatiah Aqbat St. The name means: Polish Home. The monastery is subordinate to the Head of the Polish church in Warsaw, and a hostel for pilgrims is operated on site. The monastery is a large structure on Third Wall Street and an orphanage on the slopes of the Mount of Olives. The nuns commemorate Elizabeth, a Christian saint from the beginning of the 13th century who, after she was widowed at age 20, donated her capital to the poor and hospitals, and after her death became a symbol of Christian charity. 15 Spyridon Monastery - Greek Orthodox Center of Jabsha St., near the Northern Wall St. Spyridon was a Cypriot bishop in the 4th century AD, whose embalmed corpse traveled to Constantinople and in the 15th century was returned to the island of Corfu. According to residents of Corfu, Spyridon saved the island four times: once from the Turks, once from hunger and twice from disease. Many believers come to the Corfu church to see the complete body displayed to the public for a few minutes each day and once a year his hearse is paraded on the island. 16 Unification (Alliance) Church Evangelical - Protestant Apostles St. A small, independent church which numbers about 150 believers in Israel. Unlike other churches, their emphasis is not worship but rather social activities, prayer and Scripture reading. The church center is on Prophets St. in the Old City from 1890 and the church exists since 1948. 17 St. Avtimius Church and Monastery – Greek Orthodox Saida St., near the junction of Apostles St. Avtimius, one of the greatest monks and so called "The Great", originated from Armenia and came to Israel in 406, was a hermit in the Judean desert and died in 473. A large monastery that was destroyed in Maale Adumim was named after him. Among his veteran students was Mar-Saba, after whom a famous monastery near Bethlehem was named. 18 Saidnaya (Saida) Church and Monastery – Greek Orthodox Saida St. Tradition says that Iustianus, while hunting a deer, was given directions to the deserts of Syria by the deer who became 'Mary'. Iustianus established church in Syria with an icon of the deer but the icon traveled between Jerusalem and Syria until the final plaque was set into the convent. In the compound, a small church is run by nuns and the icons highlight Maria and Anna. A large and active font is placed at the end of the hall. 19 St. Catharine Monastery – Greek Orthodox Hush Siksik / Apostles St. Catharine was a Christian saint from the 4th century, a native of Egypt who was executed by the Romans. A few nuns and families live in the small monastery. In the past it served primarily pilgrims from Russia. Was first mentioned in 1450. 20 Michael (Archangel) Church and Monastery – Greek Orthodox St. Francis St. Dedicated to the Archangel Michael who accompanies souls. An image of the angel with a sword image in his right hand and a soul in his left hand is placed at the entrance to the church on the second floor. At the center of the church is a stone "taken" from the Temple Mount where the angel stood and plagued the nation for the sin of the counting the nation in the days of David. In the Eastern corner is a chapel given to the Serbs. The place is first mentioned in the literature of pilgrims in the late 14th century. 21 St. George Monastery – Greek Orthodox St. Francis St. near Terra Santa Church One of the great Orthodox Christian saints. Recognized by his abbreviated name: George. Born in Lod in 275 approx., he served as an officer in the Roman army and when he refused to fulfill the Emperor Diocletian's orders to suppress the Christians, he was executed through torture and beheaded in 303. Later his body was brought to his hometown Lod where he was buried in the church that bears his name. Legend attributes the killing of a dragon to him. The event was added as part of his name and as a symbol at the entrance to many monasteries. He is considered the patron saint of many countries such as England, Georgia, Ethiopia, Montenegro and Russia. Also known as: Alh'adr and a church and settlement Bethlehem are named after him. Alh'adr is also the nickname of Elijah and there is a certain amount of ritual overlap with these figures. His memorial days are the date of his execution on April 23 and the date of his burial on 16 November, during which many visit the tomb and light candles. 22 St. Salvadore (Terra Santa Church - Franciscan Between the New Gate and St. Francis The Franciscan Order founded by St. Francis of Assisi, Italy in 1209, and advocated a life of poverty and lack of property. In 1339 Protection of Holy Places in the Holy Land was entrusted to the Order by the Pope and settled on Mount Zion. It was this role that gave them the nickname "the Guardians of the Holy Land "(Custodia Terra Santa). In the 16th century they were expelled from Mount Zion and in 1559 purchased a Georgian monastery in the north-west corner of the Old City where they built a large complex that includes workshops. in 1885 they established the Church of St. Salvador (Spanish name means: savior), prominent due to its high, pointed bell tower. 23 St. Basil Church – Greek Orthodox Offshoot of the curve of northwest Alfrair St., in a street alley. Named after a Christian saint, the great Basil of Caesarea in Cappadocia (Turkey today). Born in 329 and died at the age of 49. Was a theologian, an ascetic, Bishop of Caesarea and one of the leaders of the Nikia committee. Considered one of the three Holy Fathers of the Eastern Church and formulated the rules that led the church's monastic movement. Nuns upkeep the place of residence and small church, active only during the holidays. 24 Theodorus Monastery – Greek Orthodox Casa Nova St. Theodoros was a martyr from the East in the fourth century and a saint recognized in Jerusalem and in Georgia. The place formerly hosted pilgrims and now serves as monastic apartments. 25 St. Nikolas Monastery – Greek Orthodox Greek Catholic Patriarchate Street One of the largest monasteries in the Old City, it was first mentioned in 1400, named after the Bishop of Myra Lycia District in South-West Turkey, a 4th-century Christian saint who is considered to be the patron saint of sailors, prisoners and traders. In the West he became the patron saint of children. A corruption of his name in the Dutch dialect is: Santa Claus, the favored gift giver at Christmas..
26 Rosary Sisters Convent - Catholic Latin Patriarchate Street Established in 1880, the Catholic order is called "Sisters of the Holy Rosary". This is the only order established in the Holy Land in modern times, and is the largest order of nuns in the country and based on only nuns of Arab descent. Its founders are the descendants of the Latin Patriarch, Arab Christian from the North Father Joseph Tannous and Sister Alphonsine Daniel, an Arab from Jerusalem. The rosary is a Christian string of beads used for prayer and is made ​​up of five to ten sets of ten beads separated one large bead. The string is used in the Catholic Church to concentrate the faithful in prayer over the 15 events in the life of Christ, which are divided into 3 categories, each with five events: joy, sorrow and sublime events. Prayers are said between each set of beads. In Orthodox churches the rosary is mainly used by monks. The Catholic Church officially recognized the rosary in 1520 during the tenure of Pope Leo X. 27 Gala Fangaya Convent – Greek Orthodox Coptic St., before the Coptic Han The meaning of the name is "The Sanctity of the Most Saintly" and refers to Mary, Mother of Jesus. According to Byzantine tradition, the convent was founded by a Roman noblewoman named Melina who undertook a life of charity and chastity, and came to Jerusalem at the beginning of the 4th century. She lived there with 90 nuns and established charitable institutions and monasteries in Jerusalem. The convent houses two churches, one above the other, while Melina is buried in the lower church. 28 Fantlimon Monastery – Greek Orthodox Dimitrius St.
30 The Catholic Greek Patriarchy Greek Catholic Patriarchate Street, near Jaffa Gate Founded in the 18th century as cultural and social protest of local communities against the Arabic-speaking Orthodox Church and from 1724 served the Greek communities and had independent clergy. Their penetration of the Holy Land was accompanied by severe conflict with the Orthodox Church until they received recognition in 1838 by the Sultan Mahmud II the Patriarch of Antioch and Head of the Greek Catholic Church. During the British Mandate the Catholic Church grew and all believers were Arab. The church demanded exclusive representation of Catholics from the Vatican and not to allow the Latin Patriarchy to receive all budgets. In 1960, the church in Jerusalem was promoted to the status of Patriarchy, and was headed by an Archbishop. In 1848 they purchased land in the Christian Quarter and formed the Patriarch building used also as a venue for pilgrims. The Patriarch became famous in Israel when Archbishop Cappucci was arrested in 1974 when he returned from Jordan with weapons hidden in his car designated for terrorist organizations. There is no other known case of involvement in the conflict between Israel and the Palestinians. 32 John the Baptist (Prodromos) Church and Monastery – Greek orthodox Shouk Abtimous St. One of the most ancient churches in Jerusalem, it is named after St. John and in Greek: "Prodromos" - "The Herald", the nickname of John. Church is built in a curled manner with two floors. The lower floor is a Byzantine wall with an address in English from 1926 that says that English - Protestant members of the Order of St. George recite their prayers there. There is a church on the top floor with a piece of skull belonging to St. John. Apartments have been built around the church. Entrance at Christian St.
33 Church of Our Lady of Suffering - Armenian Catholic The Fourth Station Built on the remains of a church in 1881 in the early 5-6 century. The church is dedicated "Our Lady of Suffering". When digging the foundations of the church a mosaic floor was discovered with a central illustration of a pair of sandals. Some attribute the figure as marking the place where Mary stood when she saw her son carrying the cross, however, since it was attributed to the event only in the 13-14 centuries, there are others who attribute the figure as part of the corridor floor of an ancient bath courtyard without religious significance. 34 Partorium Church – Greek Orthodox Via Dolorosa St. – between the Ecce Homo Arch and the hospice junction According to Greek Orthodox faithful, this is the place where the trial (Partorium) was held. Facilities are located in the basement of the Roman prison and prisoners niches. Greeks recognize one of the prison cell niches as that of Jesus. 35 Sisters of Zion Convent and Ecce Homo Arch – Latin Catholic Via Dolorosa, entrance at Ma'aleh Hanizirut St. Convent and church belonging to the "Sisters of Zion", established by the convert Father Alphonse Ratisbon who bought the land in Nov. 1857. Other sources say that the land was bought by Ratisbonne to establish workshops for children of Jews who converted to Christianity. The Ecce Homo Arch means "This is the Man ". According to the narrative retold in the gospel of John, Roman procurator Pontius Pilate took Jesus to the people and said "Here is the man" and the people shouted: "Crucify him". You can see the continuation of the Ecce Homo Arch in the monastery (which is nothing but a triumphal arch of Hadrian from 135 AD), the continuation of the Roman floor and Herodian ground water pit. Church halls have various workshops. Entrance fee. 36 Church of the Conviction – Franciscan Catholic The Second Station of the Via Dolorosa Named for the trial / conviction of Jesus by Pontius Pilate, the Roman governor, at the Antonia fortress in 33 AD. According to tradition the trial itself was held at the first station located on the Alumriyah campus, south of the Via Dolorosa. 37 Church of the Flagellation - Franciscan Catholic The Second Station of the Via Dolorosa The 2nd station, where according to tradition the flagellation of Jesus by Roman soldiers before the crucifixion took place. According to Williams, who visited the place in 1843, the tradition dates back to the Crusades. The place was given as a gift in 1838 to the Franciscans by Ibrahim Pasha. In 1839 a new chapel was built here on the ancient remains, funded by the Bavarian Duke Macsmillian. 38 St. Nicodemus Church (Deir Al'ads – Greek Orthodox The end of Hush Al'ads – Northeast to the Church of the Flagellation The church was first built during the Crusader period. The place is identified by the Greeks as the place of Peter's imprisonment and downstairs they show the prison from which Peter was released by the angel. Another tradition identifies the place with the house of Herod Antipas, governor of Galilee who was asked by Pontius Pilate to judge Jesus. However, Herod disparaged Jesus and returned him to Pontius. The church is named after Nicodemus who helped Joseph lower Jesus from the cross and bury him. According to Christian tradition (John 3), Nicodemus was a member of the Sanhedrin, and "Officer of the Jews". As the place also served as a soup kitchen for the poor and provided lentil soup (two large pots are currently on display), the compound and the street leading to it are called: Dir Al'ads. 39 St. Anna Church – Latin Catholic Lions Gate Tradition attributes the place as the home of the parents and birthplace of Mary, Mother of Jesus. There was another church from the time of Constantine but it was destroyed. Saladin established a madrasa there named "a - Sallah". Muslims left during the middle of the 18th century on the grounds that there were ghosts. In 1856 the Ottoman Sultan told Ibn alMajid gave the place for the purposes of building a Catholic church. Keys to the place were ceremoniously transferred by the French Consul Emil Pasha, governor of Jerusalem. In 1878 the French King gave the building to the "White Fathers" order (called so because of the color of their robes) and they established a monastery and seminary. Archaeological excavations have taken place in the north area and you can see the remains of large reservoirs (100 sq. m and 15 m deep), a Byzantine church and an apsis of a Byzantine church building. The reason for the building of the church is a tradition (John 5) that it is the spot of the Bethesda pool where Jesus healed a man who had been sick for 38 years. 41 Mar Maroun Church and Monastery - Marounite St. Mark St. Residential complex, a church on the second floor and hostel (fee). Named after St. Maroun, a monk who lived in the 6th century. Most of the Marounite community lives in Lebanon. 42 Nazarene Church St. Mark St. The largest of the Protestant churches established in the U.S. in the early 19th century and are called "holy" because of abstinence from the pleasures of this world. The church's style is simple, without pictures or an altar. Founded in 1895 in Los Angeles, the church leaders and spiritual shepherds are chosen by believers. They began operating in Israel in 1821, among the Turkish Armenians who escaped the Turkish genocide. They have another church in Sheikh Jarrah, Nazareth and another community in Jordan. 43 Church of the Messiah - Protestant Opposite the Tower of David, Umar Ibn Alh'taab Square "Church of the Messiah" is a member of the Anglican - Messianic community established in 1809 as a "London-based Association to promote Christianity among the Jews" and the first Protestant church established in the modern Ottoman Empire. The motto of their faith is the Epistle to the Romans (A. 16), that Jesus will return after the return of the Jewish people to its land. A decade after the establishment of the church, the organization was founded in Jerusalem in 1849 as a compound which also houses a hospital and a school. On the wood façade the Hebrew Ten Commandments, the Lord's Prayer (Matthew and 13-9) and the Apostles' creed are written. Today the church belongs to the Anglican Church organization in Israel and is not subject to the Anglican bishop in Sheikh Jarrah. Models of the Old City are on display, as well as the Herodian tunnels and guesthouse (fee). 44 St. Mark Church – Syrian Orthodox Ararat St. / Syrian Monastery The church dates back to the 12th century and is built on the remains of buildings from the 6th. The place is a religious and spiritual center of Syrians in Jerusalem. Considered the oldest church in Israel and preserves Syrian/Armenian language in their prayers. According to their faith, this was the home of St. Mark, author of the Gospel and so his picture is placed at the forefront of the church. Also, according to tradition, here was room in which the "Last Supper" took place, and the apostles gathered in this place 50 days after Passover ("Pentecost" = fifty) and the Holy Spirit moved them. This was the place to which Peter fled after being released by the angel. 45 St. Theodorus Church - Armenian Armenian Quarter Built by the Armenian king Hatoum of Sicily in 1256 in memory of his son Toros, killed in battle against the Egyptians. The church houses a library containing many translations of Armenian church writings. The library also includes a large collection of Armenian decorated scrolls. Theodoros Mizrahi was a fourth century martyr and saint recognized in Georgia. 46 The Armenian Patriarchy and St. James Church Armenian Patriarchy St. The Patriarchy has existed in Jerusalem since its founding in the 6th century and has served an important role in many places including the Holy Sepulcher. During World War 1 the Patriarchy absorbed many refugees from the Turkish genocide. The Church of St. James is considered one of the most beautiful in Jerusalem. In the past it was a Byzantine structure built on 6th cen. remains by approval of Saladin. The current building is 12th cen.. Named in memory of James Ben Zebedee, one of the 12 Apostles of Jesus executed by Herod in 44. According to tradition, James' severed head lies in the north chapel wall. The church also buried James, brother of Jesus, first Bishop of Jerusalem, who was killed according to Jewish tradition by being thrown from a corner of the Temple Mount. Restoration of the church to its current state was carried out by the Patriarch George (1717-1749), known as the "chain carrier", which he carried on his travels to Armenia to cover the debts of the church. 47 St. George Monastery – Greek Orthodox Regarding St. George, one of the greatest saints in Christianity, see 21 (previous). 48 Church of the Angels (Deir Al Zeitoun) - Armenian Armenian Quarter According to tradition this is the house of Hana, father-in-law of Caiaphas the high priest who sentenced Jesus after his arrest in Gethsemane and before his trial by Pontius. The place is also known as the Church of the Ministering Angels, who according to tradition covered their faces when Jesus was brought to trial by Caiaphas. The current church was founded in the 12th century, probably on the ruins of an ancient church in the 4th century. The church displays the "first place the arrest of Jesus". An Olive tree stands in the yard to which Jesus was attached pre-trial according to tradition. Pilgrims used to break branches off and it is currently surrounded by a stone fence to protect it. The church serves the daily needs of Armenian community. There is also an Armenian convent. 49 Deir Al-Sultan – Ethiopian / Coptic Roof of the St. Helena Chapel in the Church of the Holy Sepulcher, near the Ninth Station Used during the time of the Crusaders as the canonic complex of the Holy Sepulcher for housing and meals. During the middle of the 18th century Ethiopian monks came to Israel and settled in this area. In 1837, they abandoned the place due to the pestilence that befell them and other monks came from Ethiopia in their place. Copts claim ownership of the place and had the support of the Ottomans, but after the Six Day War, in 1970 when they went Coptic Easter ceremony at the Church of the Holy Sepulcher, the Ethiopians took over the compound. Israel had good diplomatic relations with the Ethiopian Emperor Haile Selassie and did not bring the situation back to normal. The court refused to intervene in the status quo and a special ministerial committee did not change the situation. Israel promised in later peace agreements with Egypt to resolve the conflict, however, Ethiopians threatened to hurt the Ethiopian Jews in their land and even canceled the tradition of once in a lifetime pilgrimage to Jerusalem. Since then the conflict remains unresolved. Near the dormitory, An olive tree grows to which is attributed the place of the sacrifice of Isaac. Two Ethiopian chapels bridge the complex of the Holy Sepulcher (see below). The name of the roof is probably due to the Ottoman sultan who gave them the place. They believe that it is King Solomon's compound. 50 "Four Animals Chapel" (Higher) St. Michael Chapel (Lower - Ethiopian In the passage between the square of the Church of the Holy Sepulcher and the roof of Deir A-Sultan The place has been used as a passage between the square of the Church of the Holy Sepulcher and the roof of Deir A-Sultan since the 17th century. Since the 19th cen. it has been used as an Ethiopian prayer chapel. The upper chapel is called "Four Animals" probably because of a painting that was there and perpetuated the Book of Revelation (Revelation, Chapter VI) regarding the "four animals" known as the Four Horsemen of the Apocalypse. The lower chapel is probably named in memory of St. Michael the Archangel for Ethiopians and Copts. The upper chapel paintings are from the current century and refurbished in the '70s. The Queen of Sheba can be seen visiting King Solomon against a background of Orthodox Jews in traditional dress. 51 The Latin Patriarchy St. Peter St. The Catholic Church in Israel is called Latin, its headquarters are in Jerusalem and they number about 120 thousand believers. The Latin Patriarch was crowned immediately after the Crusader conquest, but after the conquest of Israel by the Jobites in 1187 the title of Patriarch of Jerusalem was ceremonial only. From the 14th to the 19th century, the Franciscans were used as representatives of the Catholic Church in Israel, and when Pope Pius VIIII decided to reinstate a Catholic Patriarch in mid-19th century, the Franciscans (and of course the Orthodox) opposed the process. The Latin Patriarch of Jerusalem was restored in January 1848. Because of the Ottoman ban on the activity of the Catholic Mission and desire to expand, Catholics were active among the Orthodox (with partial success) to convert them to the Catholic faith. 52 Monastery of St. Pantaleimon the Church was named in honour of Saint Cyril, Bishop of Jerusalem, the Catechist (351 AD); however, during recent times, it was renamed in honour of Saint Panteleimon, for the assistance of the Greek Community and for the treatment given to the infirm in the Patriarchate’s hospital which was situated across from the Church and housed on the first floor of what is now the Gloria Hotel. The memory of Saint Panteleimon was panegyrically celebrated in this ornate Chapel of the Monastery, duly prepared and recently enriched with Byzantine hagiographies owing to the efforts of the Superior Sister Charitini. In the evening Vespers were performed and, on the day of the feast on Monday 27th of July/ 9th of August 2010, a resplendent and devout Holy Liturgy was held with His Eminence Theophanis Archbishop of Gerasa presiding, who also preached the divine word to the numerous pious believers who participated. During the Holy Liturgy, His Beatitude Patriarch of Jerusalem Theophilos III along with Archbishops, members of the Brotherhood of the Holy Sepulchre, arrived at the Church to venerate and blessed the believers. Copyright © 2013 Jerusalem.com - an InternetDominion.com Company. All rights reserved. 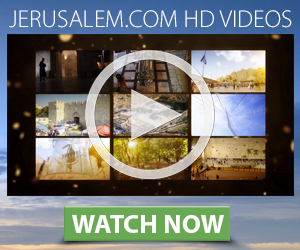 new 3D tours, photos, videos, special offers and more..
Join the largest community on Jerusalem and relgions. It's free so all can enjoy!